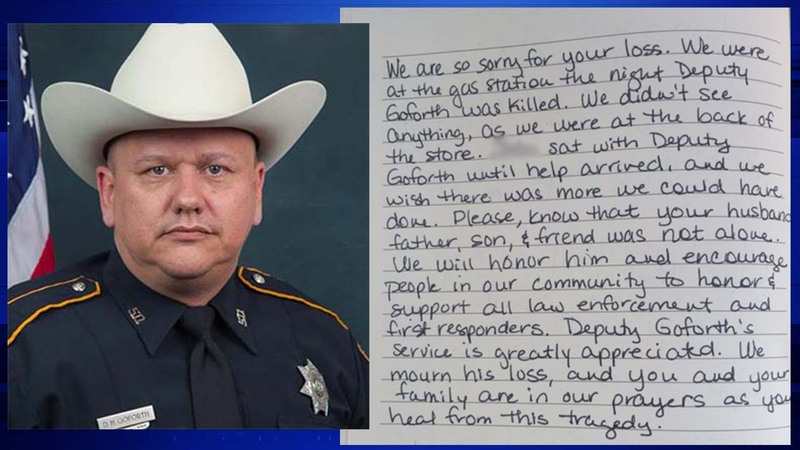 HOUSTON -- A Houston couple came forward Friday at Deputy Darren Goforth's funeral to say in a heartbreaking letter that the law enforcement officer was not alone when he died. "We are so sorry for your loss. We were at the gas station the night Deputy Goforth was killed. We didn't see anything, as we were at the back of the store. (Name redacted at request) sat with Deputy Goforth until help arrived, and we wish there was more we could have done. Please, know that your husband, father, son, and friend was not alone. We will honor him and encourage people in our community to honor and support all law enforcement and first responders. Deputy Goforth's service is greatly appreciated. We mourn his loss, and you and your family are in our prayers as you heal from this tragedy." The couple shared their name with the Goforth family, but asked Eyewitness News to refrain from publishing their identities at this time.